This is the section where you can read articles about races I have attended. I won’t go into details about races in series, but only tell you about races that took at least 4 hours. I hope you’ll enjoy it as much as I enjoyed the races. Team Gulf - Lars and I - attended the famous Le Mans 1970 Rebirth races at the notorious Tap Circuit near Kolding. 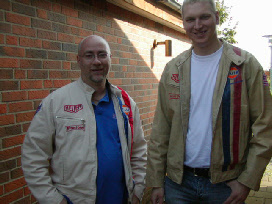 We always drove #20 Gulf Porsche 917K, so obviously we had to have the jackets too.